Two years ago I had this idea to go to Kathmandu with a billboard with a picture of Christiaan. Which was then discouraged from various sides. A few months ago that thought came back to me strongly. The first one I told it, responded with: ‘Do it!’. And the plan became reality. Alone? Or with whom? I went alone. I made inquiries about the best time, where to stay and things like that. I only told it to a few people. Why? Everyone has his own thoughts and I wanted to do it my way. It was a clear plan to me. Walking around with a billboard in Kathmandu, handing out flyers. So I could inform tourists, climbers and all who would be going to the mountains about Christiaan. October 17th, my daughter-in-law, granddaughter and a good friend took me to the airport and saw me off. In Kathmandu was a taxi driver waiting with a sign with my name. He took me to the guesthouse where I would be staying for ten nights. It was a good and simple place. I felt safe. Also thanks to the angels around me. Already the first day I walked on the streets of the Tamel. 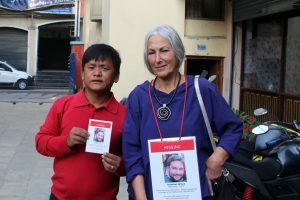 Because of the photo of Christiaan many – mainly Nepalese – were interested. Most of them took photographs, which they placed on Facebook! When I returned to the guesthouse, it turned out that a pastor of the Church of the Nazarene had already been there to greet me. I had a strong desire to share my adventures with friends and family and so the WhatsApp group app started. What a joy such a group. So much sympathy and so much kindness. Many thanks to all! That’s how it went every day. Many conversations, many questions. Not so much by the tourists. They had their eyes on what they wanted to do. When they almost went home, they were more interested. The Nepalese always asked how long he was missing. When I said two years, they shook their head. Until I got the idea to say: two years, five months and six days. They had no answer to that! I met people from the Netherlands, Germany, Italy, France, Spain, Great Britain, Australia and New Zealand. Every meeting was special, but very special was the meeting with four Australian ladies. One of them said: ‘I would do the same’. Two Dutch girls and a Spaniard joined us. We were standing in the sun and there was so much sympathy, so much cordiality, so much kindness, so many emotions … At the end of this meeting there was an international group hug. The Spaniard, the only male, asked: May I participate too? Of course! What a precious moment!! In the meantime I had met the pastor and his son. The father had to go to a conference, but I was allowed to consult the son at all times, which I did a few days later. I wanted to see something of the surroundings. He took me to two temples. A Buddhist and a Hindu. At the first one I saw remnants of the earthquake. In the second, there were plenty of cremations going on. Would it have smelled like that in the incinerators during the Second World War? The contact with the son, Anjan, was good. A very sympathetic young man. Still a student. 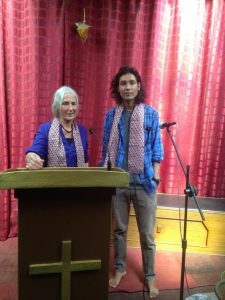 At the end of the week we went to a church together, just on the outside of Kathmandu. There I was asked to tell something and he translated. This was new for him, for us. We had a good click. 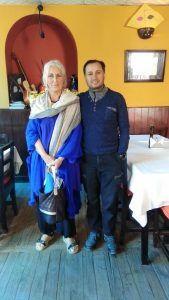 During the week I had a meeting with Karna, from SARdogs, you find him mentioned earlier on the site, and Suraj, who took great responsibility in the search for Christiaan, two years ago. Karna also appears to be a drawing and painting talent. Very special to meet them. With God all things are possible. He is the Almighty! Bedankt voor deze nieuwsbrief. 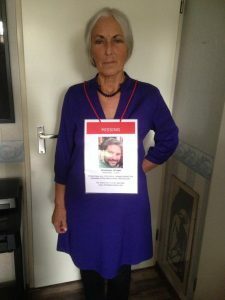 Ik bewonder je om wat je gedaan hebt. Hopelijk komt er iets goeds uit voort. Wat een bewonderenswaardig mooie onderneming! Steun en liefde vanuit Leusden.